Hey, the Academy Awards are so much more than giving awards and gorgeous dresses. You can learn a thing or two about life during the very long and drawn out annual salute to film-making, especially during the 2015 Oscars on Sunday night. Winners have a tendency to pass on their wisdom in the acceptance speeches, giving us their life advice from the pinnacle they reached by winning that golden man. Or maybe it's just the adrenaline of accepting an Oscar in front of millions of people around the world? Either way, I learned a lot of life lessons from the Oscars on Sunday and now I'm passing them onto you. Last year, I think we all learned that a selfie — especially one starring Ellen DeGeneres and a horde of celebs — can live in in perpetuity on the internet pretty much forever (is it me or are people STILL retweeting it?). I personally learned that the Academy Awards ceremony is so much more entertaining when DeGeneres orders pizza during it. (If there's anything this Oscars ceremony was missing, it was pizza.) But hey, at least we had dancing Storm Troopers, Neil Patrick Harris in his tighty-whities, Octavia Spencer guarding a lockbox, and a few other noteworthy moments. J.K. Simmons demanded it in his acceptance speech for Best Supporting Actor. "And if i may, call your mom," he said. "Everybody — I'm told there's like a billion people or so.Call your mom, call your dad. If you are lucky enough to have a parent or two alive on this planet, call them. Don't text, don't e-mail. Call them on the phone. Tell them you love them and thank them and will be to them for as long as they want to talk to you." 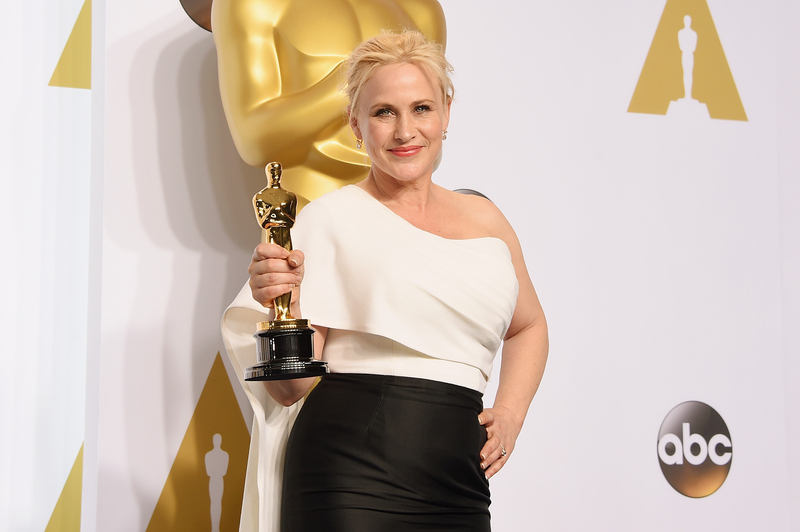 Thank you, Patricia Arquette, for an acceptance speech that had an amazing speech — and was even Meryl Streep-approved (the dream, right?). Dana Perry, along with Ellen Goosenberg Kent, accepted the Best Documentary Oscar for Crisis Hotline: Veterans Press 1 with a special message. "My main objective was to honor the responders and staff of the Veterans Crisis Line and the souls out there who are reaching out for help,” she said. “I have a personal connection to the subject, I lost my son, who was 15 when he killed himself. We need to talk about suicide out loud to work against the stigma. The best prevention for suicide is awareness and discussion. We have a crisis with our veterans. More veterans have killed themselves than who died in these wars." John Legend said it best when he and Common accepted their Oscar for "Glory," their very moving song from the film Selma. "Nina Simone said it’s an artist’s duty to reflect the times in which we live. We wrote this song for a film that was based on events that were 50 years ago, but we say Selma is now, because the struggle for justice is right now. We know that the voting rights, the act that they fought for 50 years ago is being compromised right now in this country today. We know that right now the struggle for freedom and justice is real. We live in the most incarcerated country in the world. There are more black men under correctional control today than were under slavery in 1850. When people are marching with our song, we want to tell you that we are with you, we see you, we love you, and march on." Screenwriter Graham Moore accepted his Best Adapted Screenplay award for The Imitation Game by mentioning a very dark time in his life when he was 16 years old and what he learned from it. "So in this brief time here, what I want to use it to do is to say this: When I was 16 years old, I tried to kill myself, because I felt weird, and I felt different. And I felt like I did not belong. And now I'm standing here, and I would like for this moment to be for that kid out there who feels like she's weird, or she's different, or she doesn't fit in anywhere. Yes, you do. I promise you do. Stay weird, stay different. And then when it's your turn, and you are standing on this stage, please pass that same message to the next person who comes along."